The Ukrainian army incurred no losses yesterday. Most of the shelling took place in Mariupol sector. Militants opened fire 17 times, mostly in Pavlopil – Shyrokyne frontline, as well as in Starohnativka and Bohdanivka, said Col. Oleksandr Motuzyanyk, Ministry of Defense of Ukraine spokesperson on ATO-related issues, at a press briefing at Ukraine Crisis Media Center. “One brief mortar shelling was recorded in Pavlopil and another – in Shyrokyne. In all other cases of ceasefire violation, militants used only light weapons,” he noted. In Donetsk sector, militants violated the ceasefire 10 times; they used mortars once. The most troublesome spot was around ​​Avdiyivka and Zaitseve. During the night, before 6:00 in the morning, the adversary fired upon Zaitseve several times using light weapons and once mounted weapons of infantry fighting vehicle. After 18:00, the shelling resumed. In Avdiyivka, militants fired 10 mines upon Ukrainian positions, and in Mayorsk and Pisky they used small arms. In Luhansk sector, militants violated the ceasefire eight times; 4 times – with the use of mortars. Most attacks were conducted near Krymske and Novotoshkivske. “In Krymske, the enemy conducted five attacks, 3 of which – using mortars. During one of them, 15 mines were launched at the Ukrainian military positions. In the morning Russian occupying forces opened fire on Novotoshkivske with machine guns, and in the evening they used mortars of various calibers. 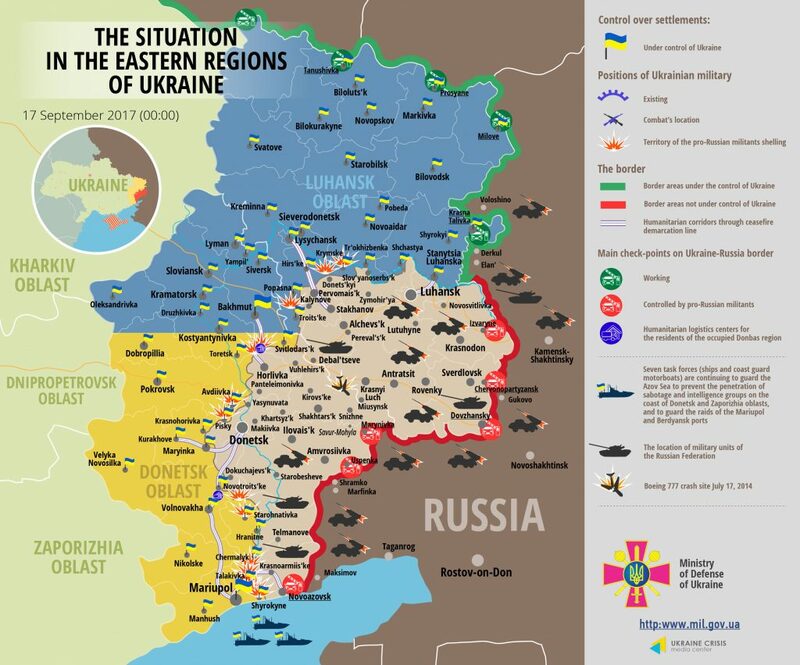 The Ukrainian military opened fire in response,” detailed the spokesperson on ATO-related issues. Colonel Motuzyanyk also informed that in Donetsk sector, Russian UAV “Orlan-10” fell near Novohradivka. “It was ascertained that its case and engine were made in Russia, electronic component was made in Taiwan (China). This is a rather expensive UAV. It costs several million Russian rubles, and is actively used by the enemy in the ​​ATO zone,” he noted. Report on the military developments as of September 16 is available here. Interactive data on the shelling: chronology shelling chart and the interactive map.